We have received our subscription copy of Reader’s Digest Magazine (India Edition – March 2015 issue before a few days. It was quite on time delivery and here are our personal reviews and views for the same. We consider – editorial – as one of the most important aspect of any magazine. It allows building a link between the editor and the reader. It is the place from where an editor shares his/her vision behind the issue and/or talk about the factors which made him/her to compile the content of the the same. This time Mohan Sivanand,the editor, shares his thoughts about “long-life”. Pages 18 through 30 are definitely one of the best part of the magazine. 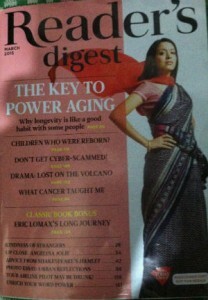 It explores two main segment we always look forward in Reader’s Digest. They are – Everyday Heroes – and – Kindness of Strangers. Everyday heroes – tells story of Max Boon. He stands against the terrorism without his legs. You can know more about him at: http://www.thejakartapost.com/news/2010/06/28/max-boon-for-love-indonesia.html. The morals, ethics and human qualities makes us better species then the other animals in addition to our brain power and ability express our thoughts and feelings via a language. Helping others when needed, is something expected from any civilised human being. But often find it a rare case. So taking note of such good gestures is definitely very important. The cases talked in the issue will make you believe in human qualities. It also inspires others following the same good path. The interview of Angelina Jolie is worth reading. Her humanitarian works are very famous and there is no need to list them here. Her interview will make you appreciate her efforts of being a better human. She bluntly tells: “The fact that I live a fulfilled life isn’t because i’m an actress“. Why so angry? – is a small article about the changing social situation. The legal aspects explore in the case of – Nominee Nephew – are worth reading as well. The articles about the contemporary things are worth reading once at least. You may like the giggle and humor stuff, but you will surely enjoy – add one word (in the movie title) and change the movie (title and meaning). The age is simply a number for a lot of people. The inspirational article about an 86-year-old theologian is very good read. Bruce Grierson wrote it nicely. Another inspirational article is – What cancer taught me. Lost in Volcano – is the real life drama where one fellow was caught in the snow storm and reached at a point where he almost lost all the hopes of his rescue. He met with the happiest moment of his life when he met with the rescue team! It makes you believe that life is stranger even then the fiction. The Children Who Lived Before – is an article by a professor. He talks about past lives. The article is targeted to a specific group of readers. It is however worth reading for all. Another article we like to mention is about – FAST – the four words strategy to take action when you or anyone in front of you suffer from heart attack. RD classic brings a story from World War time. Earlier published in Oct 1994 – this story is very heart touching and makes you emotional. It is reinforces the fact that Wars brings the animals out from the humans, and they should be avoided as much as possible. The tremendous rise in the cyber crimes shows that day by day you need to be more active towards taking safety precautions in this area. The 18 tips mentioned about how to be as secure as possible in terms of digital world are definitely worth to go for. The strange facts about various symbols – is interestingly written article. It reminds us SixtySymbols website.